I had been excited for this weekend ever since last years historics. I knew it was going to be big, but I had no idea it was going to be this big. My weekend began at 5:00 Friday morning, after a week of late nights drilling holes, mounting lights, and mainly scrubbing and vacuuming. My dad and I met up with 3 more 02s and a beautiful /6 cafe racer. We headed down 17 towards Highway 1, with some of our cars adding to the thick haze of fog coming off the ocean. Just before we got off at Hwy 68 we were passed by an e30 and then an e34 M5 Touring, a car I never seen before, I squealed inside a bit. “It’s gonna be a good day” I thought to myself. No one in our group had been to our first stop Legends of the Autobahn before and we got lost, which lead us to seeing a 3.0 CSL batmobile. We finally got to legends and I park my touring with the other 2002s, and right away I’m asked what it is. I went into this weekend thinking e30 M3s, and 3.0s were rare, but by the end of Friday they honestly had become commonplace. Which was fine, Legends offered up plenty of other beautiful cars for me to ogle. Elvis Presley's’ 507, a 700 coupe which had an air cooled motorcycle motor in it, a 1934 309, and my favorites, an e30 touring and an M1. When a 3 cylinder DKW 3=6 started up, it drew a crowd, he man that owned it also has a right hand drive Colorado Touring he brought to the Brisbane 02 show. Down the hill from the main show was the Motorrad and performance section. 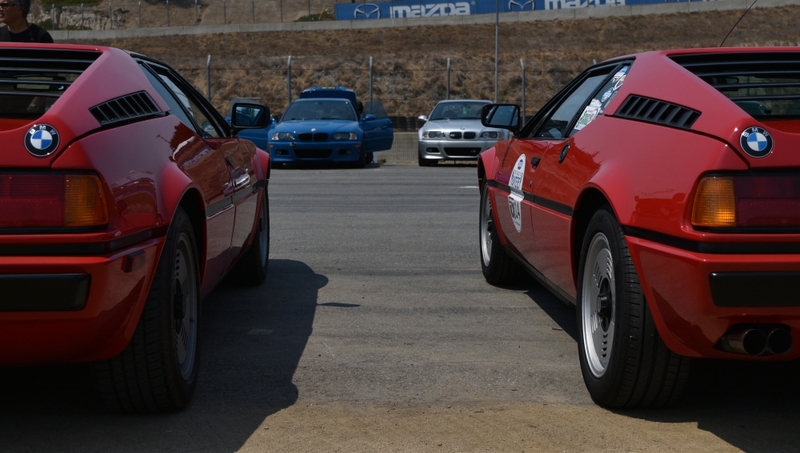 A few Z1s, quite a few Z8s, and even more M3s. We came across a whole lot of different older Alpinas, pretty sure at least one of every model made. 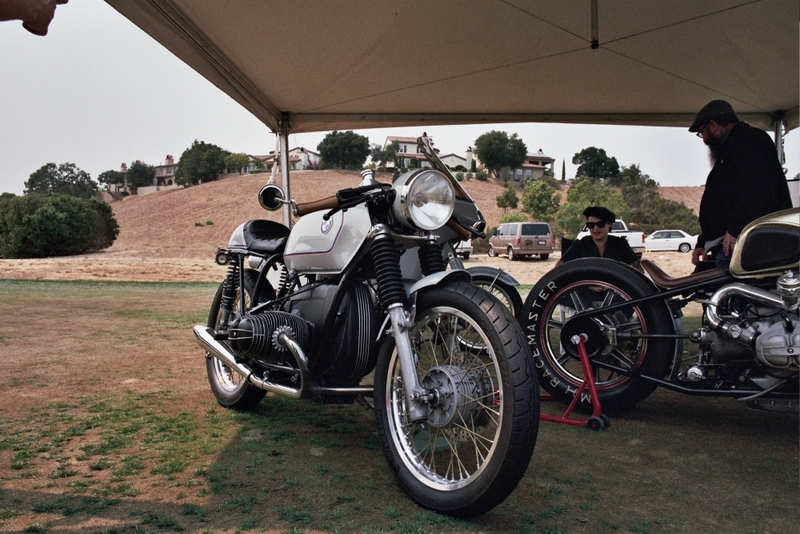 The motorcycles were a sight to see, I believe an r32, BMWs first motorcycle, and a few insanely clean /5 and /6s, including a gold twin turbo, that the owners unfortunately would not start up. Once Legends ended we went to a BBQ to revel for the evening with other BMW enthusiast. A big shout out and thank you to Doug for hosting. Late in the evening we returned to our campsite above turn 10 at Laguna Seca. In the campsite we had an 1800 4 door, an e30 325ix, an e36 M3 LTW, 4 2002s, and 3 Tourings, and a big 2002 FAQ banner on the fence.Needless to say, our site was packed, and we constantly had people stopping and asking us about our cars. I’ve seen posts about how much love there is in the 02 community, and I’ve always seen that in our group. I have witnessed this first hand with building my own car which was a year of non-stop fun and great times, or helping Coastalcrush get his crusty Colorado 1600 on the road before the Brisbane show. Saturday morning our group drove our cars down to the BMW corral and had cars and coffee on the back of Dr Suave! We watched the morning races, my favorite being the 1973 to 1984 FIA, IMSA GT, GTX, AAGT, and GTU cup, just because of the amount of 3.0s and M1s. 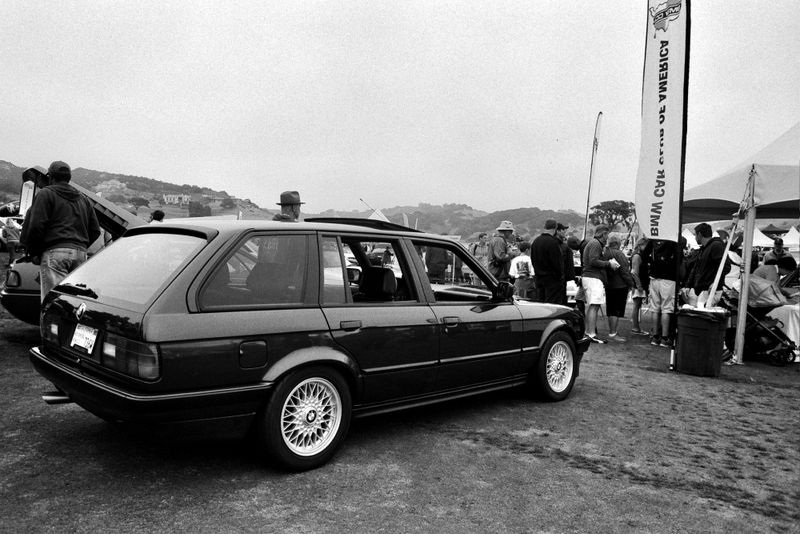 After that we got ready for the BMW parade lap, where I got to ride in Steve's all stock automatic touring. He showed the three of us all the proper racing lines to take around the track, which was really informative and interesting. When we came back in (after the parade lap) my dad and I spent a while walking around the paddock, where we saw Canepas crew readying his cars. 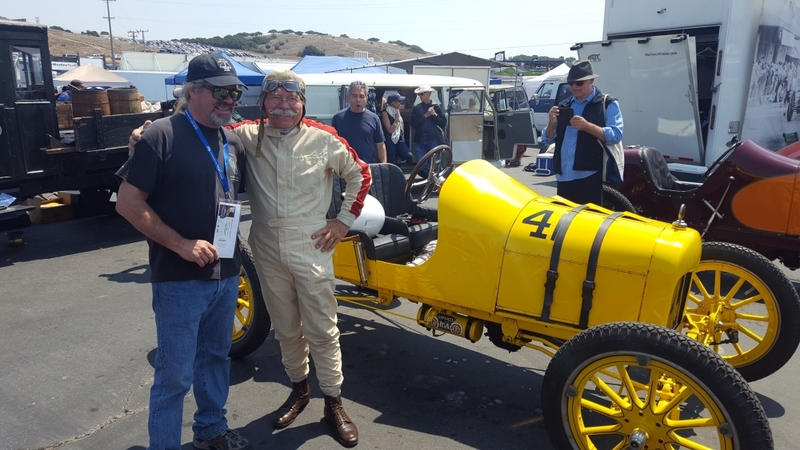 We met an older gentleman with a Model T racecar and watched him oil up and prime the fuel pump on his race car. 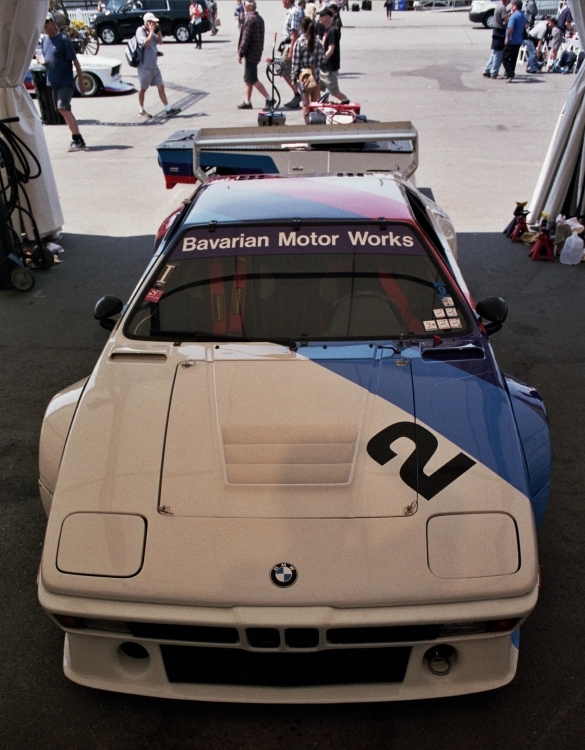 As we headed towards the main BMW tent I stopped and drooled over the silver M1 procar that had been out just eating up the track. 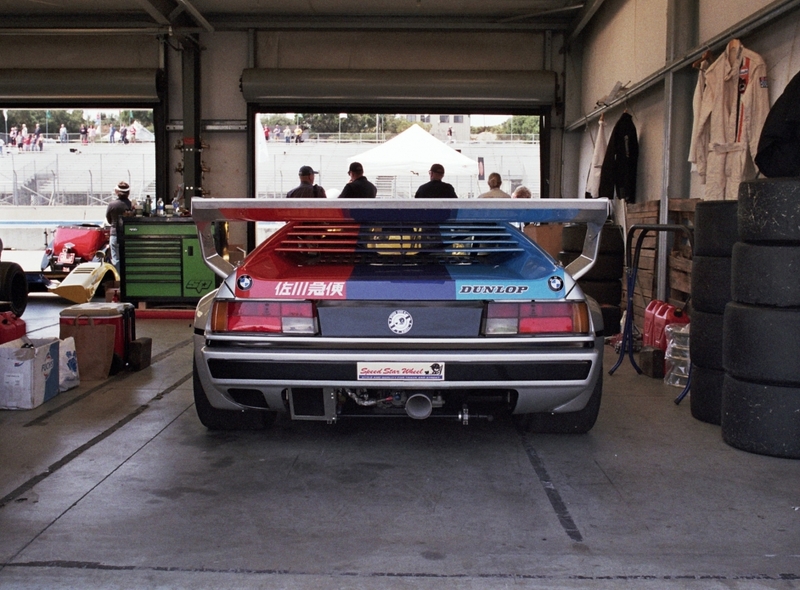 The car had originally raced in Japan, hence the Japanese lettering all over, then was unseen for 25 years, until it was bought and restored to its original condition, and now races around the world in historic races. The BMW tent was impressive. It had all the race cars on the ground, you could get right up and stick your head in them, and then there were a few show cars behind glass barriers. 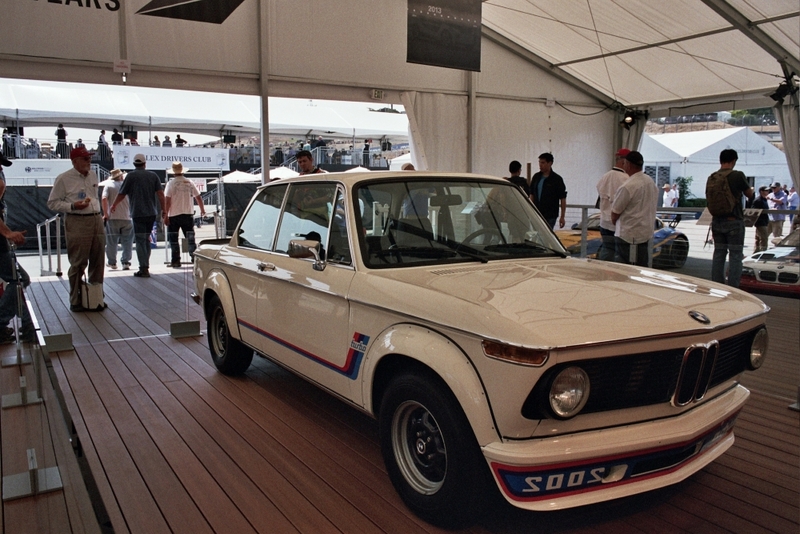 A gorgeous 2002 turbo sat in front of the 2002 Homage car (the homage car brought up a bit of a debate in our group). 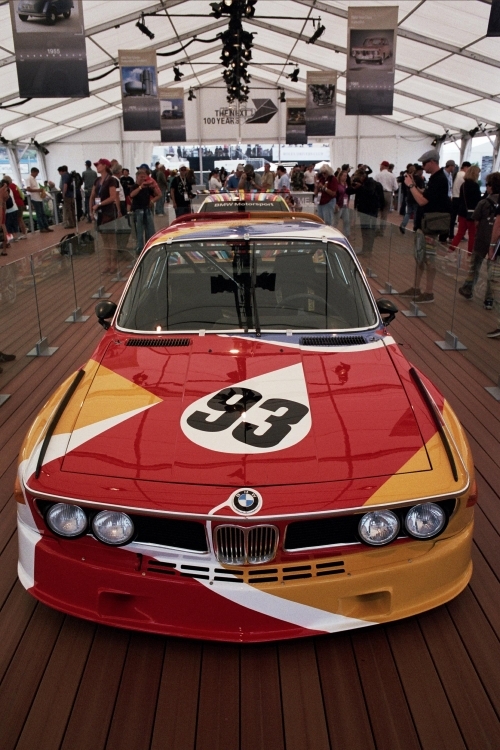 At the other end sat 2 art cars, an M3 GT2 sat behind the well known number 93 3.0 CSL art car that raced in Le Mans in 1975, you could tell it was a special car with just one glance. Sunday morning we packed up our cars with our camping gear, throwing as much as I could on the roof rack of the touring. 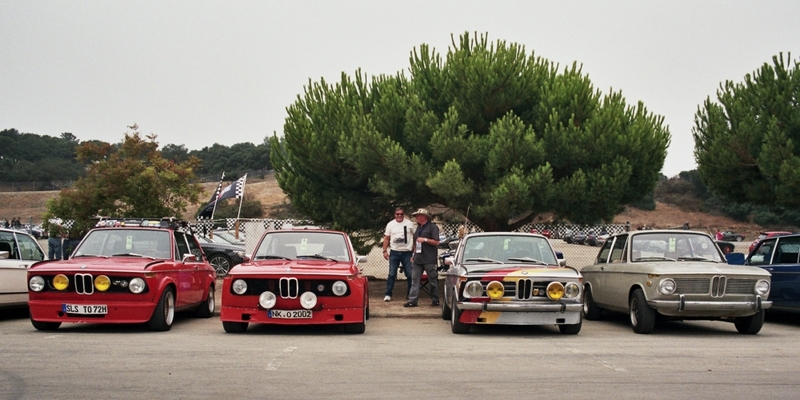 Again we brought our cars down to the turn 5 corral and talked with passersby for a bit until the 1963-73 FIA race, when we all pressed ourselves to the fence and stared in awe as 3 2002s raced around, one being an Alpina TI. We found out there were spots left for the day’s parade lap, and we quickly registered a few of our cars. This was by far my favorite part of the whole weekend. When they say you can't see a thing coming over the corkscrew, they mean you really can't see anything. But there is nothing like coming over it, downshifting to 2nd, and flooring it out. I had a smile on for the whole lap, but that part made me laugh with pure joy. A track day is now very much in order! With our cars packed, my dad and I started our drive back home, sunburned, tired, and smiling from an event filled weekend. Really cool trip! QQ - did you have to register and book camp sites and all that. I'd love to do this next year and wouldn't want to make a rookie mistake. Also, your roof rack, where did you get that awesome thing!